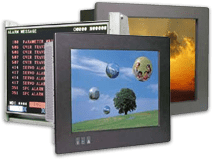 Dynamic Displays is proud to offer the following product series of rugged color LCD flat screen Industrial Panel Mount computers. Powered by powerful Intel® Celeron Pentium-III and IV processors, these rugged industrial panel PC’s have all the man-machine interface features required for nearly any factory automation and process control application. Dynamic Displays highly-integrated Human Machine Interface (HMI) products are optimized for superior performance in a multitude of demanding environments such as ATM, Kiosk, factory shop-floor control panels, and many others. Our advanced Industrial Man-Machine Interfaces are packaged in a compact, yet rugged, galvanized steel chassis with water-resistant NEMA 4/12 bezels and VESA-standard mounting configurations. These Industrial Panel Mount Computers incorporate a multitude of interface options – such as optional 2.5″ HDD’, USB ports, serial and parallel port, compact flash slots, as well as keyboard and mouse connectors. All these features are packaged in rugged space-saving NEMA panel PC chassis that fit in the most compact of kiosk, ATM, or shop-floor control environments. Each rugged Industrial Panel PC and Man-Machine interface supports 10/100 Ethernet and sound and can be fitted with an optional touch screen that greatly enhances the advanced features of these Man-machine interfaces with built-in multimedia functionality, yet still meets the NEMA 4/12 environmental requirements.